Mozambique guide, offering accurate information on Mozambique hotels, lodges, camping sites as well as scuba diving, snorkelling and fishing information for the whole of Mozambique. How to book flights to Mozambique and organising your holiday to Mozambique. 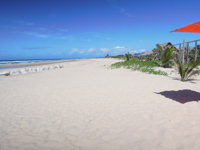 Popular activities at Mozambique holiday resorts include Scuba Diving, Snorkelling and Fishing. Mozambique is an ideal destination for everyone with a variety of accommodation, great weather a place to really escape the rest of the world and enjoy the natural beauty that is Mozambique. 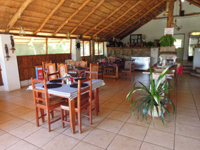 A collection of places to stay along the main road from Johannesburg, through the Lowveld, across the border to Maputo then along the Mozambique EN1 road north where you can stopover safely for the night to break a long journey. Known for its good beaches, great swimming, excellent diving and fishing with plenty options for accommodation - access by 4wd only lodges will collect from Kosi Bay border. 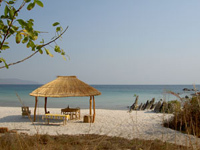 Capital of Mozambique, a compact city with the Indian Ocean on two sides, vibrant nightlife, good seafood restaurants. 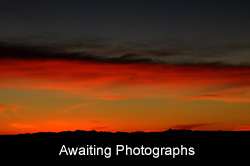 Hotels can get booked up well in advance so remember to book ahead. A small village and a hub for divers, snorkellers and sunseekers, a selection of accommodation options, restaurants, bars and lovely beach make Tofo a relaxing place for a holiday. Excellent fishing beaches and good fuel supply. Xai Xai is a well equipped town wih a good fuel supply and cash machines. A good place to stopover on the way north. 180 km north from Maputo this sleepy village has a variety of accommodation and lovely sandy beaches around a tranquil lagoon with a sea entrance. Inharrime a quiet little village south of Inhambnae halfway between Maputo and Vilanculos ideal as a stopover or even just for a stop to stretch your legs and have a drink. Down a 4wd sandy track Guinjata bay has several places to stay and offers beautiful beaches, fishing, diving, kite surfing, long sandy beaches and great atmosphere. The most northerly city in Mozambique far away from everywhere beautiful beaches, peaceful people and gateway to the Quirimbas islands. Vilanculos is a busy seaside town with a selection of restaurants, accommodation and a vibrant nightlife and gateway to the Bazaruto Islands. This part of the coast is all old coconut plantations so plenty swaying palms and long sandy beaches, 4wd preferred to get to these remote peaceful places. A world heritage site with amazing history and full of crumbling old buildings, forts and people all hanging on to this small piece of history in the Indian Ocean. Used to be the coasts capital. A natural deep water harbour the peaceful bay offers fantastic diving, fishing snorkelling and swimming not easy to get to but more difficult to leave as after a few days you will adjust to the wonderful pace of life. An almost forgotten city of Mozambique Beira is a bustling port city especially for traffic to and from Zimbabwe, tourism interest is limited to being the nearest airport to Gorongosa National park. 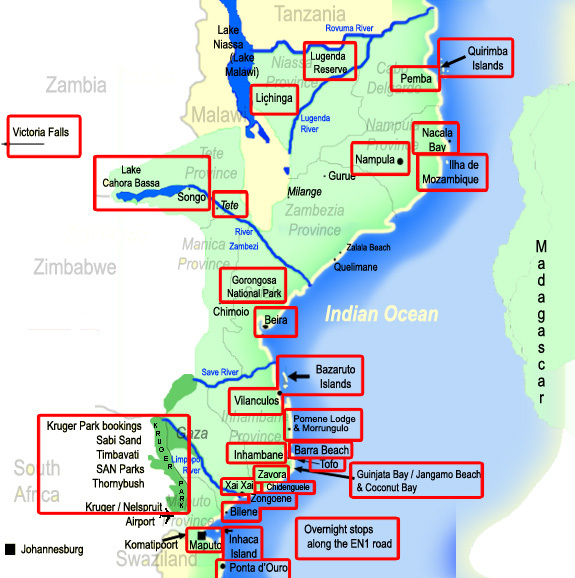 Nampula city north of the Zambezi river, business in the area is mainly mining.Nearest airport for access to Mozambique Island (Ilha De Mocambique) a couple of hotels and fuel available here. Tete is Mozambique most inland town and an important centre for trade with central Africa, growing due to lots of new mining discoveries in the area and the hydro electric dam project at Cahorra Bassa. Over 20 years in building the hydro-electric dam created a huge fantastic fishing lake. Tiger fish are the main draw but plenty fishing is available all year. It is quite a trip but the remoteness makes it a fishing trip to remember. The most remote and untouched part of Mozambique, from the shores of Lake Malawi (called Lake Niassa in Mozambique) Niassa offers the ultimate pioneering safari in a part of Africa still wild and untouched. Africas most exclusive safari. A safari here is to go where few have travelled. Not for first-timers it is a journey of discovery for safari pioneers to a true quality of wilderness that is rare to find, one of the 'last wild places'. A group of exclusive islands stretching along the northern coast, luxury lodges with excellent food and service, watersports, snorkeling, diving and sunbathing in an exclusive remote area. These beautiful islands known as the 'Pearl of the Indian Ocean' are perfect Island escapes in the Indian Ocean just off the coast from Vilanculos accommodation choices are top end lodges. Just across the bay from Maputo, an ideal getaway from busy life, daily flights and at the weekends a ferry take you across to this sleepy Mozambique Island, where you can relax. Inhambane is the main town along the southern coast, no good beaches here but fuel, supplies and gateway to Barra beach, Tofo beach and Guinjata beach. Out on a sandy peninsula this is a lovely area for those who want peace and quiet away from the crowds and resorts. Small lodges offering good value. Across the bay from Barra beach and accessed by 4wd or boat transfer only, the remote beautiful sandy beaches are perfect for those seeking escape crowds. Ideal destination for Tiger fishing and a good stopover between Kruger park and Mozambiques coast Massingir Dam, stretches 20kms into the Elefantes Gorge. Information on Visas and Entry requirements, immagration and general information such as weather, border times, culture, cuisine and law enforcement. Nothing really to see or do in Maxixe but a good place to get fuel on the road north. A passenger ferry runs between Maxixe and Inhambane across the bay. Mozambique has several islands off is coast offering the perfect island holiday destination, including Inhaca Island, Bazaruto Island, Benguerra Island, Vamizi Island, Quilalea Island, Ibo island, Matemo Island, Medjumbe Island and Ilha De Mocambique (also known as Mozambique Island) . Each Mozambique island has its own unique character some are beautiful uninhabited islands, some historic islands with forts and others are Islands full of people and culture..